We’re finally starting to get armed with some more useful tools to allow us to understand and design some practical circuits. Today I’m going to talk about another of Kirchoff’s contributions to circuit theory, Kirchoff’s current law. To beign we need to define something called a node within the circuit. 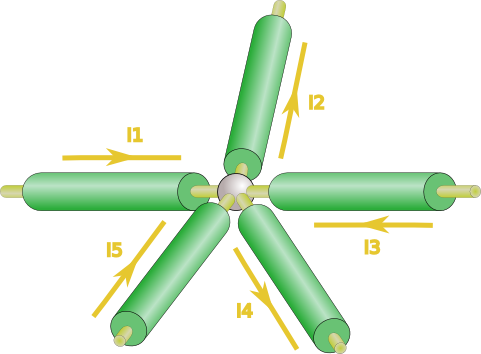 Basically a node is where two or more wires connect to each other. Now what does Kirchoff say about current? Have a look at the next circuit. 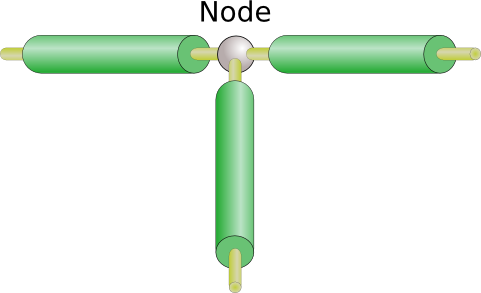 All current’s flowing into any node must be equal to all current flowing out of that node. By the same law we see that . So . This makes sense, all the current leaving the battery returns to the battery. Now, you may well be asking how will this help us in designing circuits? I know I was wondering such things when I first learned this stuff. Well, it turns out this is a useful tool in understanding our next topic which is a bit more practical. It doesn’t take much imagination to figure out why they’re call series and parallel. So why are these two topologies important? That’s what we’re going to look at now. We’ve seen that we can use Ohm’s law to find unknown voltage, currents, and resistances. Now we’ll use that and Kirchoff’s laws to find something called equivalent resistance. To get an idea of what we call equivalent resistance think of a battery connected to a circuit. Some current flows out of the positive terminal of the battery, I, and that terminal is at some voltage, V. From Ohm’s Law we know that . So we say that the battery is connected to circuit with an equivalent resistance of R. In other words we could replace the circuit with a resistor of value R and get the same current out of the battery. Let’s look at one example starting with a series resistance. So in general the equivalent resistance of a bunch of resistors in series is just the sum of all the resistor values. Just add ’em all up. Now what about the parallel case? …. Now all we need to do to find Req is…. Note that the value of is less than any of the resistor in the circuit. This is always the case. You’re probably thinking, ‘Hey, I don’t wanna have to solve all those current’s and whatnot just to get an value.’ I don’t either. Fortunately there’s a shortcut. This is reasonably easy to do on scientific calculators. Before continuing to a final example I’d just like to clarify one point that may not be obvious. When we refer to equivalent resistance, we’re talking about the resistance that the source ‘sees’ looking into the circuit. In the previous two examples we showed that draws the same current from the source as the original circuit. The source can’t tell the difference between the two, so they are considered equivalent. Now, here’s one more example to get us home. All we want is , so we don’t care about the voltages or currents. We’ll just use our two formulae. It’s best to start with the equivalent resistance for just the parallel resistors. In most cases I like to reduce any parallel resistances to an and then add the series components. So here the source would ‘see’ an equivalent load of 63.88 Ohms. So far we’ve developed a quick theoretical foundation to understand how this all boils down to electrons. Then we’ve moved to some basic circuit theory in Kirchoffs laws. We used this theory to gain an understanding of Ohms law and to figure out how to analyze some circuit topologies. Finally we discovered how to figure out equivalent resistance. So far you may still be scratching you’re head about how most or any of this applies to actual circuit designs. I’ll give you the low down on what I use. In general I don’t think much about atoms or electrons. I don’t really consider electric fields (well not for circuit design anyway). I do use the ideas behind Kirchoff’s laws, not to calculate values, but you need to know that the total voltage around a circuit is zero (all sources balance by all loads). Even more important, I use Ohm’s law all the time and frequently need to calculate an equivalent resistance. You’ll see soon that we come back to these basics time and again. Next time we’ll start looking at basic components: resistors and diodes. This is really good basic presentation in Hardware circuit design. It would be really good if you could provide knowledges about switch mode power supply design, Amplifiers, power electronics, switching circuits etc. Thank you for such an amazing content. Looking forward to seeing more of it!